When it comes to planning and organising a wedding, many couples will find that there is a battle between style and functionality. There is always a desire to have everything looking at its best while also creating stories and cataloguing memories of the happy couple’s time together. This means that finding the perfect wedding stationery can become a time-consuming task. There is a lot to arrange when planning a wedding but considering the importance of doing things right and making sure that you are happy with everything you do, it can be difficult to find a perfect wedding invitation that encapsulates your love. The problem is compounded by the fact that your wedding invitation needs to be functional. There is no point in sending out a stylish and elaborate wedding invitation that doesn’t contain all the details and information that your guests need. This is why most couples will decide that an invitation that carries a simple yet attractive style and plenty of customisable options is right for them and this is where the Damask wedding invitation truly shines. Coming on 300gsm shimmer card , this is a wedding invitation that exudes class and elegance. However, the simplicity and functionality comes with the fact that the personal details are printed on an enclosed 150gsm insert paper. This is a wedding invitation that offers the best of both worlds so if you are keen to have a stylish invitation that leaves everyone confident about where and when the special event is taking place, this will be ideal for you. 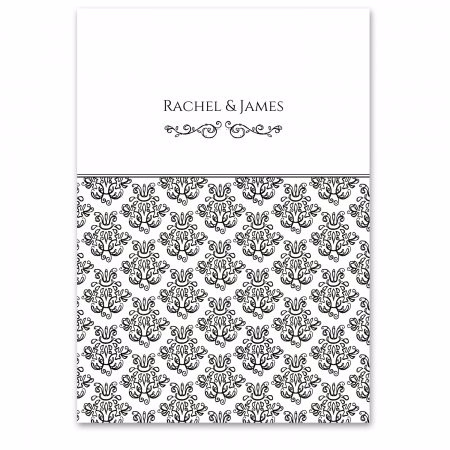 There is also a range of stationery in this style so if you have a lot of pre or post wedding correspondence to take care of; the Damask option from Chapter One is a great choice.